The weather recently has been a bit miserable, but yesterday was perfect for cycling – blue skies, light breezes and not too cold. I took the opportunity to go out on my first decent ride in a while. 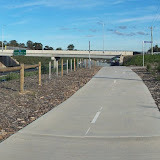 Home to Heatherdale railway station in Ringwood via the Dandenong Creek and Eastlink trails. Total distance 55.55 km in 3 hours 10 minutes. Uphill most of the way with a light headwind, so I took it easy. Average speed just 17.5 km/h.